In this webcast, Opus Research’s Dan Miller will introduces a presentation by Jennifer Rufati, Head of Customer Operations Customer Service Centres at Australia’s Westpac Bank. Rufati will deliver a presentation that includes details about how Westpac encourages customers to use a multiplicity of communications channels, including social media platforms, to conduct their banking and satisfy customer care requirements. 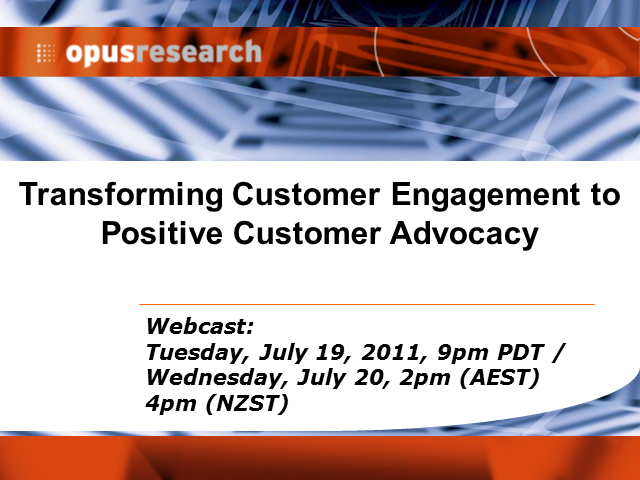 Based on “Net Promoter Scores,” they have tangible evidence that they have turned customer into advocates.